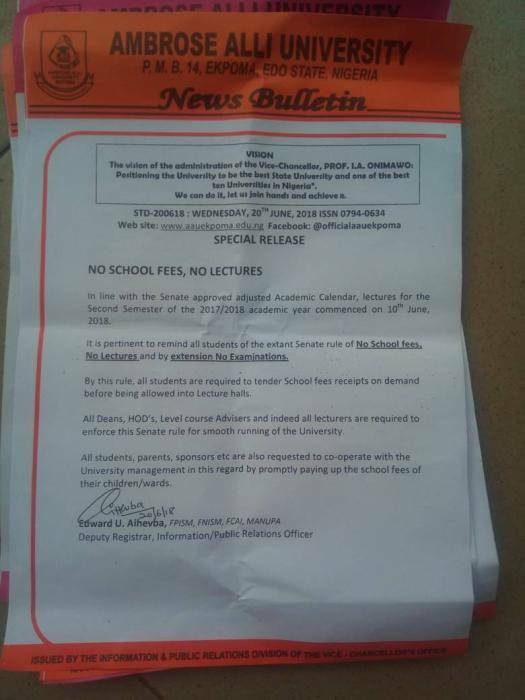 The Management of The Ambrose Alli University, Ekpoma imposed the policy of “No School Fees, No Lecture” on students. As a result, student must show their school fee payment slip before entering the lecture hall. Only those with an evidence of payment are allowed entrance. Following this information, the Student Union Government led by Comrade Esabu Joseph called an emergency meeting with his Excos and quickly Informed the Vice chancellor Prof I. A Onimawo on the stand of the Union. The Vice chancellor called for an emergency Senate sitting to review the policy. Hence, the senate has decided to suspend the policy until 16th July, 2018. This is to allow student meet up with their school fees payment befor implementing the policy.